SolarCity keeps doubling its install base, but the stock is down by half. Here's what to watch for when earnings come out. Much of the beating has happened since June of this year, but SolarCity's stock is well down from its all-time high in March 2014. 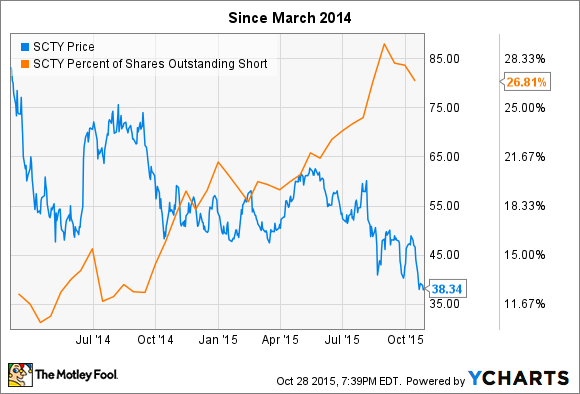 Since then, the percentage of shares sold short has steadily increased. Over the same period, the company has more than doubled in size, spreading into new markets and growing its base of long-term contracted customer payments, but Mr. Market has remained fearful. With earnings set for release after the market closes on Oct. 29, what should investors expect? Let's take a closer look. There's little doubt that SolarCity will report higher operating expenses when earnings come out, and it will probably report a loss, but context is key here. As CEO Lyndon Rive described in the most recent shareholder letter, the company is divided into two key parts: The sales and installation business, which it calls the "Devco," and the portfolio of long-term contracts, the "Powerco." The vast majority of the company's increased expenses are tied to the Devco, which is the growth engine of the business. The company's cost per watt, one of the best measures of cost efficiency in the solar industry, declined sequentially last quarter but was higher than in the third and fourth quarter of the prior year. This isn't because SolarCity's expenses for maintaining its existing customer base went up, but because the company had recently started major expansions in new markets. So for a couple of quarters, costs per watt jumped sequentially. If you look at the chart, you'll see that the same thing happened at the beginning of 2014. The point? These are scalable cost increases to grow the business, not operational expenses dragging down the long-term results. Take the time to understand where the company is spending, since all expenses aren't created equally. The company could stop selling new systems entirely and still generate nearly $8 billion in revenues over the next 20 years. That's not profit, but it's a massive amount of predictable cash flow that the company has built. Contracted payments carry some risk since they aren't money in hand, but I think many who view it as a big risk for SolarCity are overstating it. After all, a solar system isn't like a smartphone or some other gadget that people spend a significant amount of time interfacing with and will readily replace when better technology shows up. Solar systems pretty much exist in the background. Yes, the industry is incredibly dynamic, and technological advancements are driving efficiencies up and costs down. But that's not something the average consumer is going to think about. Frankly, once a solar system is installed, that customer will probably think about it as often as he or she used to think about a power utility: about once a month, when the bill comes. The reality is, improving technology and lower costs aren't going to lead to current adopters pulling their panels off the roof and tossing them into the street in a rush to get the latest and greatest. It'll just mean more commercial and residential customers will be able to benefit from solar, and the eventual end of government support for solar systems won't crush the industry. It could, however, weaken SolarCity's ability to reach its assumed rates of renewals in 20 years. If technology down the road is significantly better and cheaper, the company will probably get fewer renewals, and at lower rates than the company is projecting. SolarCity isn't producing GAAP profitability yet, but that's because the company is spending a ton of money on aggressive growth. Of course, that creates more risk, since the company is using debt as part of its strategy. However -- and despite what one short-seller is claiming -- that debt isn't subprime debt, since the majority of SolarCity's customers are homeowners with solid credit ratings. Further, the company -- when factoring out the investments in growth and focusing on the operational costs of managing the contract base -- has shown that it can generate an adequate return on the capital it funds with debt. At some point in the next few years, its cash flows from its growing contract base will reach an inflection point where they reduce the need for as much debt to help fund growth. It's going to be choppy seas until that happens, but it'll be easier to sail those waters if you keep an eye on the fundamentals of the company's cost structure, the growth in contracted payments, and how the cost-per-watt trend plays out over time.